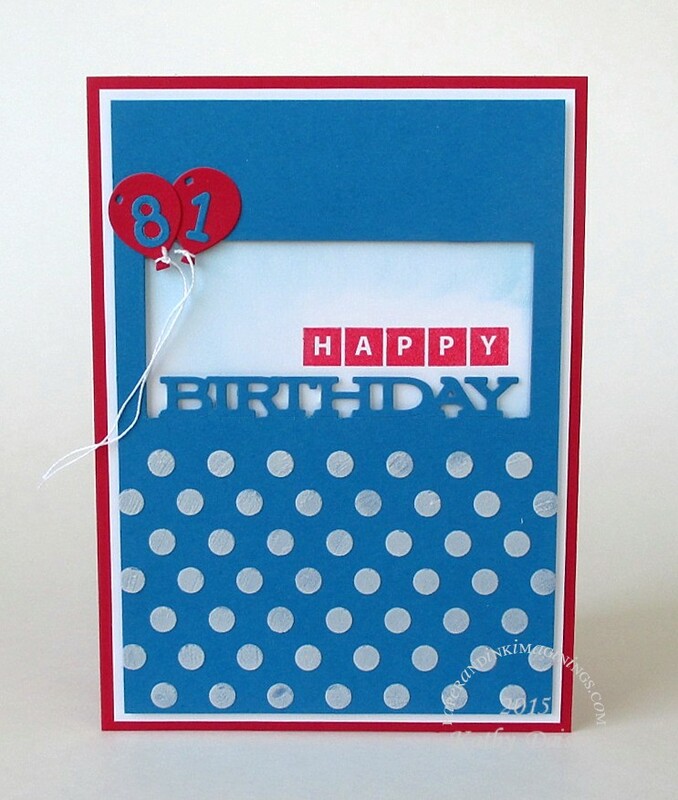 This week’s Papertrey Ink Make it Monday (#207) – Double Partial Die Cuts provided inspiration for a birthday card for my Dad. I partially cut the word BIRTHDAY and a rectangle out of Pacific Point cardstock. Did a little bit of ink blending in the window using Distress Ink Tumbled Glass. Added embossing paste polka dots with a Heidi Swapp stencil. Final touch – numbered balloons! The entire blue layer is popped up on foam tape. Supplies: Stamp – Papertrey Ink, paper – Papertrey Ink White, Stampin’ Up! Pacific Point, Real Red, inks – Tim Holtz/Ranger Distress Ink Tumbled Glass, VersaFine Satin Red, dies – Lawn Fawn (rectangle), Papertrey Ink (word), Provo Craft (numbers), Taylored Expressions (balloon), stencil – Heidi Swapp, embossing paste – Dreamweaver, embossing powder – Filigree Fine Art Powder clear, floss – DMC. Categories: birthday, card | Tags: card, DMC, Dreamweaver, Lawn Fawn, Papertrey Ink, Provo Craft, Ranger, Stampin' Up!, Taylored Expressions, Tim Holtz | Permalink. Wow~ This came out fabulous! I love the added texture in the polka dots and your double partial die cutting came out great! I love how this came out the die cutting is great.the 81 on the Baloo is a nice touch.